These fabulous, new ‘chignon and braid’ styles are taking centre stage in all the international fashion shows this year! The hair is highlighted in a range of caramel blonde shades, deepening to brown at the roots. 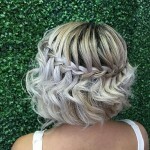 From the front, a beautiful French braid moves around the head forming an amazing patterned band, perfectly highlighted by the mixture of shades. Then a free-form chignon is fixed in an asymmetrical off-centre position above the nape, showcasing the darker hair at the back beneath the braid. A pretty, loose strand of hair is left free before the ear to soften the line and create a casual accent around the face. 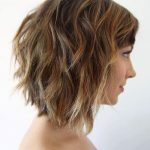 This fantastic hair design is a wonderfully creative blend of all the latest colour and styling trends that are producing such exciting new looks! This hairstyle is great for wedding, prom and homecoming.